This book is for developers and system administrators who use ElasticSearch in a wide range of capacities. Prior knowledge of ElasticSearch and related technologies would be helpful, but is not necessary. ElasticSearch is a distributed search server similar to Apache Solr with a focus on large datasets, a schema-less setup, and high availability. This schema-free architecture allows ElasticSearch to index and search unstructured content, making it perfectly suited for both small projects and large big data warehouses with petabytes of unstructured data. This book is your toolkit to teach you how to keep your cluster in good health, and show you how to diagnose and treat unexpected issues along the way. You will start by getting introduced to ElasticSearch, and look at some common performance issues that pop up when using the system. You will then see how to install and configure ElasticSearch and the ElasticSearch monitoring plugins. Then, you will proceed to install and use the Marvel dashboard to monitor ElasticSearch. You will find out how to troubleshoot some of the common performance and reliability issues that come up when using ElasticSearch. Finally, you will analyze your cluster&apos;s historical performance, and get to know how to get to the bottom of and recover from system failures. This book will guide you through several monitoring tools, and utilizes real-world cases and dilemmas faced when using ElasticSearch, showing you how to solve them simply, quickly, and cleanly. This is a step-by-step guide to monitoring your ElasticSearch cluster and correcting performance issues. 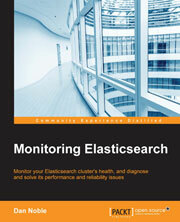 It is filled with lots of in-depth, real-world use-cases on solving different ElasticSearch cluster issues.